It's How Big And Goes How Fast? Tony Niemczyk at Englishtown this year. Stop me if you've heard this before but I love Competition Eliminator. From the first time I went to Indy in 1967 and saw Joe Law beat Gary Sullivan in the Comp final I knew that there was something special about this group of racers. I don't know if it's the ingenuity, the wide variety of power plants or just the people themselves who populate the class but I just find it exciting. Come to think of it maybe it's just the sheer excitement of watching a four-cylinder car get a big head start over a supercharged V-8 powered machine. Of course these days, thanks to new technology, it may be the four-cylinder car that is giving the head start to a V-8 powered machine. That's because the new turbocharged engines make so much horsepower that they can turn times and speeds that were unheard of years ago. Recently Bruno Massel has received a lot of attention because of the way his Chevrolet Cobalt, and now his dragster can perform, and while he has won a pair of Lucas Oil World Championships he is not the only one running the new breed of engine in Comp Eliminator. More and more we are seeing the creativity and potential that can be achieved with these engines and they could be the wave of the future in the class. 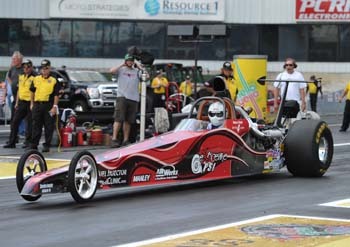 No longer will it be a Pete Shadinger running his straight-eight dragster that excites us in the class, or Charlie Seabrook with his "Jersey Jimmy" GMC six-cylinder machine, now it may be the turbo entry of a father and son team from Pennsylvania that gets our attention. That team consists of Bob, the father, and Tony, the son, Niemczyk, and their car is a slick little four-cylinder, 125 cubic inch creation that really flies. One of the latest entries into the Competition Eliminator field this father-son duo took the circuitous route to the big leagues. "Originally I was racing in the old NOPI series," Tony said. 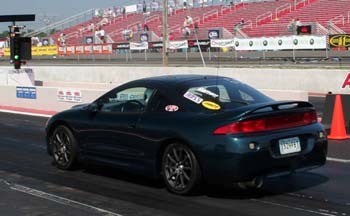 "I had a 1995 Mitsubishi Eclipse GSX complete with a turbocharged engine and it ran very well and we had a good time with it." While the car did perform better than average you have to wonder what Bob was thinking, after all, he was your classic "old school" racer who grew up with those V-8 powered machines I mentioned. "Yeah, I raced back at Atco in the 1960's and I loved the 'class racing' that was the norm back then," Bob said. "But when I came to the races and saw the potential in the car and engine that my son was racing I was really impressed." As well as the car ran, like every race car it wasn't perfect. "As you might expect it had some driveline issues. When you try to run in the 10-second range on street radial tires it puts a lot of wear and tear on the parts" Tony said. The solution was to build a car that could maximize the power of the turbo engine and had a driveline that could handle all of that power, so when NOPI announced that they were going to form a dragster class the pair decided to jump right in. 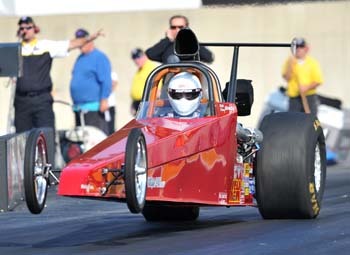 I'm sure you have heard that old saying about the best laid plans going astray; well that's what happened to the Niemczyk's once they decided to build a dragster. 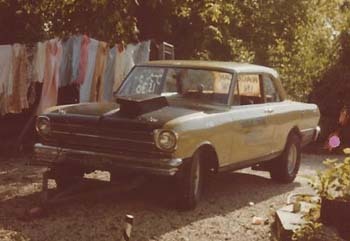 "We contacted Ken Kissinger at Kens Customs Chassis," Bob said. "Ken does a great job and he had done some work on Tony's Eclipse and we wanted him to build the chassis for our dragster. 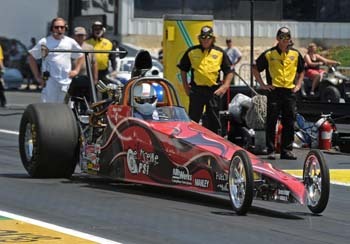 While he was doing that the NOPI series was taken over by NHRA for their sport compact program and the dragster class was eliminated." 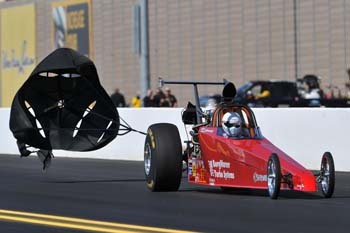 So now the pair had a car but nowhere to run it, nowhere that is except the NHRA Competition Eliminator class. "Dad loved the idea of racing 'first to the finish line,' after all, that's how he started racing. We knew the car would fit into the I/Dragster class so we decided to go forward with the project." he deserved to get behind the wheel. I do miss driving but he's doing a good job." The car initially ran some high 7-second times in 2009, dipped into the low 7-second range a year later and finally reached the 6-second zone in 2011. "We saw steady progress and were fortunate enough to set the record in 2011 and then lower it last year." Overall they have set or re-set the record three times and they currently hold the I/D record at a sizzling 6.57 - 204.17 mph. "Setting the record is great and it's something we are all proud of. Another highlight of our year last year was being the number one qualifier at the Maple Grove national event. That is such a historic track and a great event for Comp cars, so be the top qualifier was really something special," Tony added. As you can imagine building a car or and engine like this is not an easy proposition, and while Bob and Tony have spent years refining their combination they are more than happy to share it with the world. "We are actually building some engines for other people," Tony said. "We are offering these engines for sale and we take pride in being able to say that we put the same time and care into every customer's engine as we do our own. And we're not just talking about race engines, either. If someone wants a really good motor for their daily driver we can handle that. From a short block to an all out racing engine we can do it all." So far in 2013, according to Bob, things haven't gone according to plan. "We have had a lot of little things happen. We broke a part at one race and actually spun the tires at half-track at another and that had never happened. Tony is doing a good job on the line and if we can get everything to fall into place we should be ok." They will get their next shot at the Division 1 race in Epping in a few weeks and then again at Maple Grove for the national event, and while the operation basically centers around Bob and Tony there are some others who bring their special talents to the team. "Chris Regan is a good friend of ours and he is a BMW mechanic by trade so he understands these cars and he comes with us to the races. And then there is my brother, Roger. He's the chief cook and we all know how important that is when you are on the road. Those two are a big part of our team." While Bob is retired and enjoys working on the car, Tony, a mechanical engineer by trade, still has a day job. "He works at Lockheed Martin in the day so that limits the time he has to work on the car, but every moment he can he spends thinking about how to make it go faster." For an old Stock Eliminator racer, turned bracket racer, Bob admits that he loves this new technology. "I didn't know if I would like it at first, but when I saw what these engines could do I was amazed. Now I love everything about it." And what's not to love about a new car in Comp that has 125 cubic inches and can go over 200 mph? That's what makes this such a great class. And of course, with any team like this, it couldn't be possible without the help of many people and companies. Bob and Tony would like to thank Extreme PSI for standing behind this project since day one and they have been an excellent company to work with. Thanks, too, to Rick Steinke for all of his assistance with the transmissions and BorgWarner turbo systems for building the amazing 76mm turbocharger that the team runs. They also want to thank Fuel Injector Clinic fuel injectors for providing matched injector sets to a level that no one else can, Manley Performance for their pistons and valves living in this extreme environment and Kiggly Racing for the valve springs, engine girdle and support along with Scott's Engine Specialties for all of the machine work and AEM Performance Electronics for the infallible engine management system and sensors.